1. G.O.Ms.No.72, General Administration (SC.A)Dept., dt.18.05.2018. In the reference read above, orders were issued constituting the 11th Pay Revision Commission for the State Government employees. 2. 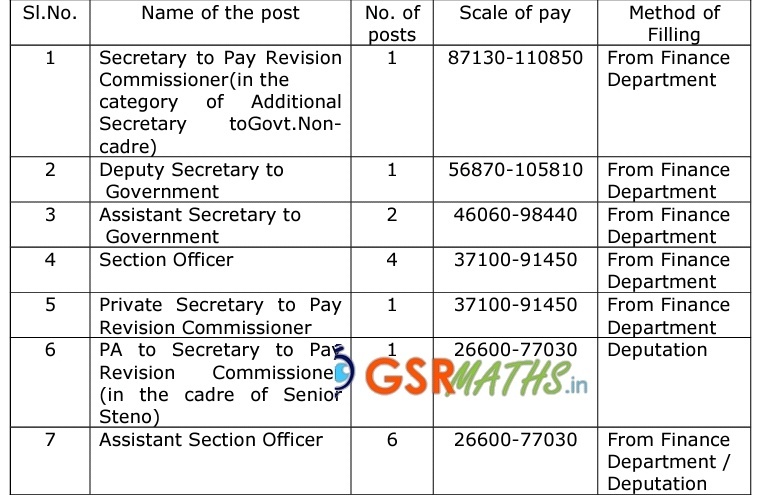 Government decided to sanction the staff to assist the above pay revision commission and hereby accords sanction for creation of the following supporting staff for assisting the Pay Revision Commission on temporary basis. 3. In addition to the above temporary posts, the Pay Revision Commission is also permitted to outsource the services for office assistance through qualified agencies duly defining the service parameters for monitoring performance. 4. The Finance (OP.I/OP.II) Departments shall take further necessary action to fill up the posts sanctioned. 5. The expenditure shall be debited to the Head of Account “2052- Secretariat General Services – MH.090 – Secretariat – S.H. (06) – Finance Department”.